The images on the cover of the card and the monetary gift on the inside aren’t the only focal points of the card. Believe it or not, people typically pay attention to the wording inside the card. Some cards come with funny wording pre-written inside, but you also have the option to write in your own funny quote, phrase or message. Joke about the birthday boy’s age, or be sarcastic about a gift you know he wants but you couldn’t afford to purchase. Keep the humor tasteful. Sometimes kids and adults want a gift you don’t have the money for. Just because you aren’t able to buy the gift doesn’t keep you from joking about it. 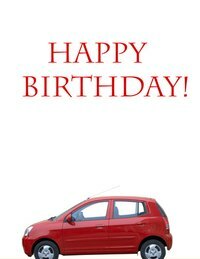 If your teenage son wanted a sports car for his birthday, design him a birthday card with a car on the front and write, “Hurry up and look outside” underneath the image of the car. Once your son looks outside and sees nothing, he’ll read the inside of the car and find the words, “Maybe next year” or “Keep picturing the car, it may show up one day.” This humor works with vacations, electronics, pets or whatever gifts the birthday boy wants. A sarcastic, yet simple, funny saying to put inside the card is, “You would have loved the gift I didn’t bother getting you.” Even though he may be disappointed, you’re bound to get a laugh out of him. You don’t have to relate the humor in the card to a gift or the birthday girl’s age. Just whip out the jokes and put them in your card, or purchase a card with the wording from a retail store, print a birthday card online for free or visit a greeting card company. A funny joke to add to the card is, “Two tips for your birthday: 1.) Forget the past; you can’t change it; 2.) Forget the present, I didn’t get you one.” Try to avoid jokes about subjects you know will upset her, like death, having no job, being alone or anything else she has confided in you that bothers her. Some greeting card companies offer cards from her favorite comedy television series like "The Office" or "30 Rock," which have different jokes as told on the television show itself.